We are a unique entity in the industry, actively committed towards manufacturing a qualitative range of Car AC Compressor Cylinder Head. Mahavir Die Casters Pvt. Ltd.
With our expertise and trustworthiness, we are engaged in manufacturing and supplying an optimum quality range of Compressor Cylinder Head. - Used in automobile industry for assembling of vehicles. We are amongst the most reputed names in the industry, offering Compressor Cylinder Heads. 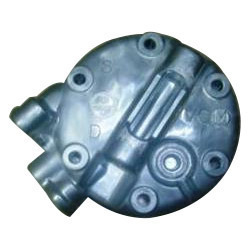 We are a top-notch organization, engaged in providing Air Compressor Cylinder Head.